Nom nom nom! 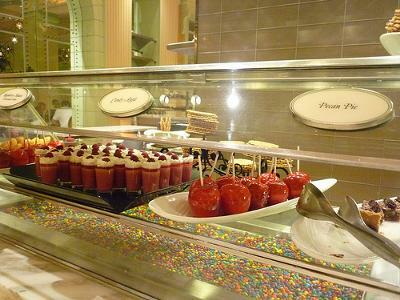 I love the buffets at Vegas! I don’t go to all-you-can-eat buffets at home, but for whatever reason they’re a quintessential part of the Vegas experience. My “Las Vegas Diet” consists of a buffet soon after waking up, say 11 AM, then a late-night special meal at about 1 AM. That’s all you need (plus plenty of booze, of course). The single best buffet in terms of good food for good money is probably Main Street Station downtown. The Golden Nugget is also a pretty good downtown buffet. The Rio, just off the Strip, has two excellent buffets, their regular one and a seafood buffet, that are well worth the trip over there. Bally’s and the Flamingo have decent, reasonably-priced buffets; if you want to splurge, go to Bellagio, the Mirage, or Paris. If you follow only one piece of advice on this list, make it this one: avoid the buffet at the Boardwalk Hilton at all costs. I’d skip the Sahara, the Excalibur, and Circus Circus as well.